Rock & Heavy Metal on vinyl albums from 1980s, of band-names starting with the letter "D"
This webpage lists all the Heavy Metal (incl Black, Crossover Death, Speed, Power, Thrash Metal) from the 1980s and collectable Hard Rock/Punk LP's as from the 1970s. Names are ordered in alphabetical order of the first part of the name. Bands which have a large discography (eg Accept, AC/DC) will have a seperate and dedicated webpage for their discography. DAD D.A.D - Sleeping My Day Away + Stencil . D-A-D is a Danish rock band previously known as Disneyland After Dark, a name that had to be changed after a threatening lawsuit from The Walt Disney Company. 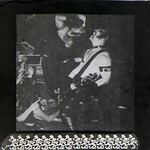 This album "DAMNED - Live at Shepperton 1980" was made live at a special gig played for the members of The Damned Fan Club at Shepperton, England in 1980. Dan Ar Braz, born Daniel Le Bras (15 January 1949, Quimper, Brittany), is a French (Breton) guitarist and the founder of Héritage des Celtes. 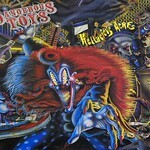 This is the second album by heavy metal band Dangerous Toys. It was released in 1991 and produced by Roy Thomas Baker. "DARK WIZARD" is a Heavy Metal band from the Netherlands (Holland), this album "Reign of Evil" is their only and final (last) full-length album. "The Catherine Whee"l is David Byrne's musical score commissioned by Twyla Tharp for her dance project. The Catherine Wheel premiered September 22, 1981 at the Winter Garden Theatre in New York City. The tracks "Big Blue Plymouth", "My Big Hands", "Big Business", and "What a Day That Was", were performed live by Talking Heads in 1982 and 1983; the latter two appear in their Stop Making Sense film, and "What a Day That Was" appears on the album. "White Snake" is the first solo album by David Coverdale, released in 1977. Coverdale would use the album title as the name of his future band, first known as "David Coverdale's Whitesnake" and soon afterwards shortened to just Whitesnake. This album is often incorrectly called Whitesnake, and should not be confused with the 1987 album of similar name. "Act III" is the third studio album by the thrash metal band Death Angel, released in 1990 on Geffen Records. Regarded by many critics and fans as the band's best recording , the album was produced by famed metal producer Max Norman (Ozzy Osbourne, Megadeth, Loudness), and marked the first (and only) major label release by Death Angel. "The Ultra-Violence" is the first album by the band Death Angel, and was released in 1987. "Koo Koo" is the title of the debut solo album by Debbie Harry, released in August 1981 while Harry was still a member of the group Blondie. is the debut album by the American thrash metal band Defiance. It was released in 1989 on Roadracer Records. 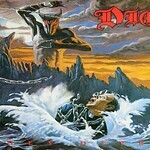 It was the only album by Defiance to feature Ken Elkington on vocals and had cover art by Ed Repka. 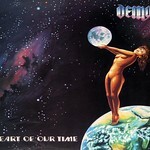 "Taking the World by Storm" is the seventh full length album by the NWOBHM band: Demon. 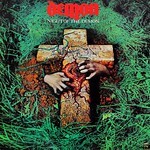 The album was produced by Mike Stone who also produced several other albums for Demon as well as Discharge band. DESPAIR is a Speed/Thrash Metal band from Dortmund, Germany and was founded in 1986. "Atom Winter" is the 2nd Full-length album by "Destiny" and is the 1st album with singer "Zenny Hansson". The album was engineered by Ilbert, Chips, Henryk Lipp. Chips is short for "Chips Kiesbye", musician in the Swedish "Sator" band and successful producer of several Swedish rock/metal bands. The drawing on the front cover is by Derek Riggs, known for the album covers and other artwork for "Iron Maiden". "Maxium Destruction" is the first official full-length album by the American Thrash metal band: Destructor. Devil Dogs - Big Beef Bonanza! Bonjour L'enfer is a split/compilation by Devil's Records with tracks by some of the French best heavy metal bands like: Killers, Sortilege, Vulcain and others. This is the album by the Heavy Metal band Diamond Head and this is the original release of 1987 by FM Revolver Records before being re-released by Heavy Metal Records in 1994. Dirty Blonde were a hard rock / heavy metal band from LA and performed rock the style of LA Guns and Ratt, but also with a more melodic streak than either of those bands. Dirty Looks - Turn of the Screw (Who's Screwing You) . "Dirty Looks" is a Hard Rock band from San Francisco. "She Lay Gutted" is the second album by this American Death Metal band. The Nightfly is the first solo album by Steely Dan co-founder Donald Fagen, released in 1982. When Dream and Day Unite is the debut studio album by influential American progressive metal band Dream Theater. The album is composed mainly of material that originally surfaced during the band's early years as Majesty. Dr Feelgood - Sneakin' Suspicion . "Dr. Feelgood" is a British pub rock band, which was formed in mid 1971. The name of the band, Dr. Feelgood, is slang for heroin, or for doctors who are prepared to overprescribe drugs. "Wreckage in Flesh" was recorded by the American Punk, Thrash Metal band: "Dr. Know" during June-August 1988 at "Pacific Sound, California" by sound engineer "Scott Campbell". For the recording of this album, Campbell was assisted by "Bill Metoyer". Eddy Schreyer at "Capitol Records" took care of the mastering. The album packaging, artwork and photographs were done by Alison 'Mouse' Brown, Eric Gottesman and Wendy Kramer.